The Travellers Guide has a great choice of Channel Island hotels suitable for family holidays and weekend breaks. View the latest "early booking" special offers and "dinner, bed and breakfast" deals which some hotels of the Channel Islands are currently offering. The Channel Islands include Jersey, Guernsey, Alderney, Sark, Herm Island plus the smaller uninhabited islands of Jethou, Brecqhou and Lihou and islets called the Minquiers, Écréhous, Les Dirouilles and Les Pierres de Lecq, Burhou and the Casquets. The Channel Islands are a great place to go on holiday as there are beautiful sandy beaches for families, stunning coast lines along which you can walk for miles and lots of delicious restaurants where you can eat freshly caught seafood. The Old Government House Hotel & Spa is the longest established and most historically famous hotel in the Channel Islands and dates back to 1858. Just a minute from St Peter Port High Street, this town hotel offers every facility you would expect of a first class international luxury 5 Star hotel. The Hotel La Tour in Jersey dates back to the 17th century when it was originally a merchant's house and now a 3 star hotel, blends modern and traditional styles. Situated in the picturesque village of St Aubin, Hotel La Tour offers 30 en-suite bedrooms with an exciting mix of the historic and the contemporary with fantastic add-ins like Jacuzzi baths, four-poster beds and even private terraces. Close to the famous Mont Orgueil Castle (5 minutes walk) and the picturesque quayside of Gorey Harbour. Near Grouville Bay which is popular with tourists for its broad, sandy beach and shallow, warm water. 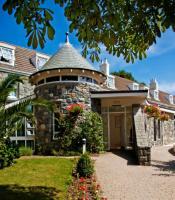 The 15 bedrooms have all the modern amenities, many have views across the harbour and 3 have balcony access. The award-winning restaurant specialises in seafood and fresh fish and with a long-standing reputation is not to be missed. 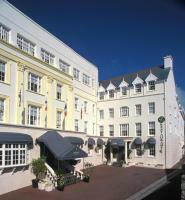 Built in 1765, the 3 star Les Rocquettes Hotel is a superb St Peter Port hotel within walking distance of the town centre. Formerly a country mansion and transformed into an hotel in 1946, over the last few years the hotel has been substantially enlarged and improved. L'Horizon Hotel & Spa is a luxury hotel which overlooks sandy St. Brelade's Bay in Jersey. Guests can use L'Horizon's Health Club which has a fantastic indoor heated swimming pool (with large floor to ceiling windows and great seaside views), Jacuzzi, sauna, steam room and small gym. Some rooms have a balcony. The Hotel de Normandie is ideally located for the perfect holiday. The bustling town centre of St Helier with its diverse collection of shops is a short walk away. Across the road is the wonderful Bay of St Clement, with its fine sandy beach and promenade. Just a few minutes walk will bring you to the beautiful gardens of Howard Davis Park. On the harbour at St Aubin, the Old Court House Inn provides luxurious rooms and a restaurant and bar on Jersey's southern coast. This inn enjoys stunning sea views and is close the village's shops, cafés and pubs.